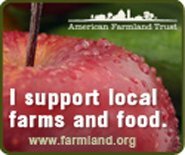 The Green Mountain state of Vermont has an inspirational number of CSA (community supported agriculture) farms, weekly farmers markets and the most remarkable cheese trail. The Vermont Cheese Council, dedicated to the “production and advancement of Vermont cheeses,” offers a cheese trail with 41 Vermont cheese making members (www.vtcheese.com/cheesetrail.htm). 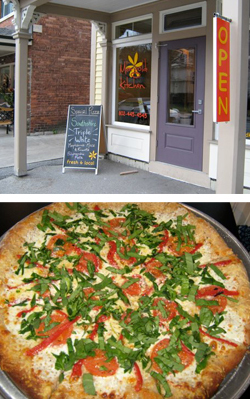 No surprise then that Vermont would be the home of Marigold Kitchen in North Bennington, in the southern part of this green and environmentally-conscious state, which is serving up delicious pizza using fresh, local Vermont ingredients. After a leisurely drive in late fall to the Southern Vermont Arts Center to see a remarkable exhibit on The Vermont Barn, which included strikingly beautiful photographs by the artist, Alan Nyiri, and a quarter scale model of the timber framing of a barn by the craftsman Eliot Lothrop of Building Heritage (based in Huntington, Vt. near Burlington, which restores and preserves barns), we decided to stop at Marigold Kitchen on the way home to Albany (across the border from Vermont, in upstate New York) for a pizza utilizing fresh and local Vermont sourced ingredients. Just as bread can now vary from factory manufactured Wonder Bread to artisinal whole grain Berkshire Mountain Bakery loaves, we are witnessing, though at a much slower pace, pizzerias which are focusing on serving artisinal, hand-crafted pizzas utilizing fresh and local ingredients. The dining directory on this website includes a half-dozen pizzerias which have taken this praiseworthy approach. In addition to Vermont’s Marigold Kitchen, our farm to table dining listings include these additional pizzerias which utilize fresh and local ingredients: Cheese Board Pizzeria in Berkeley, California; Roberta’s in Brooklyn, Dr. Ho’s Humble Pie near Charlottesvile, Virginia, Great Lake in Chicago, Arturo’s Osteria & Pizzeria in Maplewood, New Jersey, and Harry’s Pizzeria in Miami, Florida. Chicago’s tiny Great Lake pizzeria, with its 14 seats and long lines waiting for its pies (only three or four kinds are featured each night), has created a major buzz in nation-wide media. My dining companion and I chose to share Marigold Kitchen’s “Margi” pizza (Large, $18.00), made with fresh Roma tomatoes (instead of a sauce), fresh hand-stretched mozzarella from Bennington’s Maplebrook Fine Cheeses, and a generous topping of spinach (which was substituted for the usual ingredient of fresh basil, which had run out for the day). It must not have been easy for the pleasant, young woman taking phone orders to explain to callers that spinach was replacing basil on that evening’s pies. My dining companion strongly prefers spinach to fresh basil as a topping, so we were more than agreeable about the substitution. We also requested an additional topping of roasted red peppers ($4.00). The delectable fresh Roma tomatoes, red peppers and spinach were sourced from Touch of Peace Farm in North Bennington. Marigold Kitchen gives three options for the pizza’s crust: (1) original, made of organic white and whole wheat flour, (2) Vermont, made with local organic wheat from Gleason Grains, and (3) gluten-free Bennington Bakery vegan crust. We chose the Vermont crust and were pleased with its grainy yet surprising airiness, which perfectly complemented the sweetness of the tomatoes and freshness of the mozzarella. With fresh tomatoes and no sauce, the spinach also stood out. The pie was perfectly cheesed with a light touch, so that the other ingredients were complemented and not overwhelmed. We balanced the pizza with delicious Greek salads ($9.00) made with local greens, cucumber, Kalamata olives, fresh and deliciously tangy feta cheese from Polymeadows Farm and Creamery in nearby Shaftsbury, lemon and olive oil. Our next visit, we look forward to trying the kitchen’s Fiona pizza, made with ricotta, fresh mozzarella, asiago, and basil pesto. Marigold Kitchen also offers a non-dairy Stella pizza, made with marinara and Daiya non-dairy mozzarella cheese. With an added special topping (14 listed on the menu) of roasted red pepper, the Stella pizza would make a great choice on a third visit!